Sometimes you need to address the really big issues. This is not one of those times. But this procedure gives you a good idea of the kind of little detail that can make your organization stand out. We covered another example of this in the SOP on Labeling Equipment. Little things like this truly separate the pros from the newbies. Every profession has "little things" that you learn over time from trial and error - or working with a pro. Clients may never notice the little things. But they will benefit from the little things. And sometimes, as with Velcro, they *will* notice if you do it wrong. There are many kinds of Velcro products that we might use from time to time. There are two primary uses: 1) Tying cables together, such as cable management on a rack, or 2) Securing equipment to a shelf or wall. Carrying Velcro Ties is a standard part of the technician's tool kit (see the SOP on Technician Supplies). Normally, technicians are not required to carry the larger sticky-back Velcro. A little of that is handy, but it's primarily used when setting up equipment. Technicians should always have a roll of Velcro ties. It is a good habit to do a little clean-up of any cabling you work with. Obviously, anything you are installing fresh should be clean and neat and beautiful. But even when you need to move a few wires on a snake pit of an equipment rack, you should clean it up a bit. 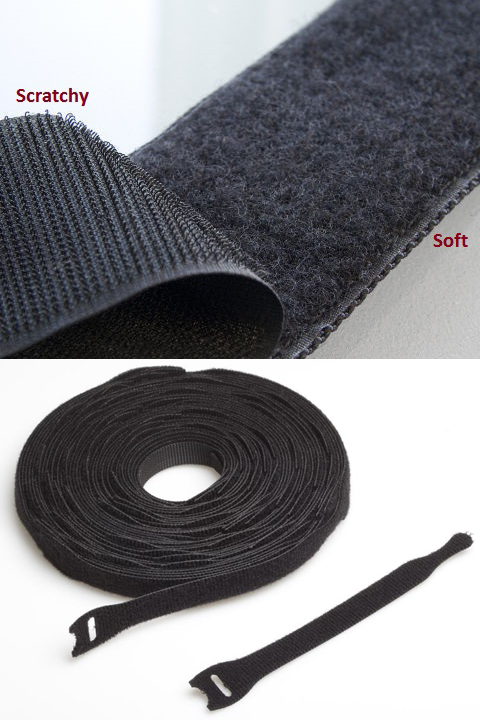 The more important (and less obvious) guidelines for Velcro involve the mounting of equipment. Velcro has two components - one is scratchy and one is soft. The single most important rule of using Velcro to mount equipment is that you ALWAYS put the soft side on the bottom of the equipment. This does several things for you. First, if the soft side is on the bottom of the equipment, it cannot scratch shelving or furniture it's placed on. Clients may not appreciate this - but really wouldn't appreciate it if you scratch the hell out of their furniture. And while we normally place routers, switches, and firewalls on crumby shelves in the equipment room, you never know where it might get moved to in the future. From time to time, you will need to stack some equipment. When you do that, you will always need to have one side of the Velcro on the top and another side on the bottom. Whichever side is on top must always be on top. And whichever side is on the bottom must always be on the bottom. That way, anything can be stacked on anything and you don't have to think about it. Bring it all together: The same side always has to be on the bottom. It's best to have the soft side on the bottom, so you ALWAYS put the soft side on the bottom of the equipment. From time to time you need to mount a device on the wall, normally on plywood in the telephone equipment room. It's a good idea to keep some drywall screws in your tool kit. Sometimes you can put the screws directly into the plywood and mount the device that way. If you need to (or prefer to) use Velcro, it's obvious which side to mount on the wall, right? The bottom of the equipment will have the soft side, so you need to mount the scratchy side on the wall. Even the Velcro that's self-stick will probably not stick to plywood for very long. So take those drywall screws and use them to mount the scratchy side of the Velcro. You need to use the same rule (Always put the soft side on the bottom of the equipment) with wall mounted equipment because you don't know where it might be in the future. I stopped using plastic zip ties several years ago in favor of Velcro ties a few years ago. They're sooo much better. They're much easier to remove and change. Periodically I will still use a plastic tie but its much less common than my use of Velcro. That said the majority of installations I see from other IT providers have everything done with plastic ties and they are very difficult to remove. Those plastic ties are very easy to remove if you carry a decent small diagonal side cutter. Am I the only one who brings the little red gun with the tie cutter on it? no worries on cutting your cables with the diagonals, and if you see some really loose and useless ties, you can tighten them up too. Chris - I completely agree with you. When I go to the data center and see huge collections of cables zip tied together, all I can think of is how horrible it would be to change out one cable. Christopher: Post a picture or link of that tool! This is great and I will be adding it to our training list. We have a procedure that we teach on how to use the Velcro for wrapping cables. We insist on the Velcro to be wrapped around one cable through the eye, so that the tie is anchored to one wire in the bundle. This is useful with long runs of cable that uses multiple ties so you can loosen all the ties at once and not have to worry about hunting for the ties when you get done adding the new cables. Also when you are using it for wrapping excess cable in a single cable instance the cable tie doesn't get lost and is readily available when you need it.